Sweet potato is one of the most important starchy crops. It’s an herbaceous, perennial creeper cultivated as an annual crop. In Africa, Uganda is the biggest producer of Sweet Potatoes and third in the world after china and India. The orange flesh variety is preferred because has high amounts of beta-carotenoids, associated with preventing vitamin A deficeny can cause blindness. Some have high dry matter, and are traditionally the most preferred types, while others have low dry matter and are less preferred. You can also differentiate sweet potatoes by their skin and flesh color. The most predominant skin colors are white and pinkish; while the flesh colors are mostly yellow and orange. Outstanding sweet potato varieties grown in Uganda include; Tanzania, Tororo 3, New kawogo, and kakamega. Sweet potatoes can be produced in low and high altitudes as long as the soils are fertile. 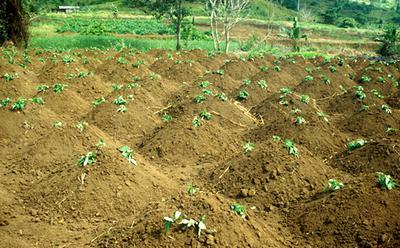 Seedbed for sweet potato should be fertile and well prepared without big soil clods.The huge soil clods would interfere with tuber development later during growth and development of the crop. You can propagate Sweet potatoes vegetatively using stem segments called vines. These are taken from the top of the old stems and caution should be taken to avoid chloric, mottled, wrinkled or vines with mosaic patterns. Plants with mosaic patterns could most likely be having a viral disease. sweet potato is either planted on mounds or on ridges using vine cuttings. Vines are the mature stems and are taken from the shoot. A good vine cutting should be about one foot long or about 6 nodes and should be disease free. 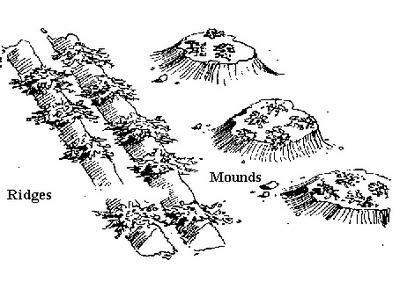 When mounds are used, they should not exceed a height of 1m in height and diameter. The size of the mound however varies with the type of soil. In soils that are prone to drying, small mounds are used; big mounds in such a case are over exposed to sunshine and they dry out very fast. The numbers of vines used do vary, as small mounds will take few vines and the big mounds accommodate more vines. Planting is mostly done by hands, but you can plant sweet potatoes using forked sticks in some cases. Vines for planting should be picked and allowed to wilt in the shade for a week before planting. This ensures that the vines do not break during planting as fresh vines are brittle. These vines also root easily and ensure faster establishment of the crop in the soil. Sweet potatoes should be kept weed free in the first months this is done by weeding around the ridges/mounds. Weeding is normally done by hand. After about 2 months, the canopy of the crop is normally big enough, covering the ground and this helps to keep away weeds. A sweet potato plant matures between 4-7 months depending on the variety. To harvest you can use a hoe or digging fork to gently remove the soil from the ridges or molds. When digging up your ridges and mounds during harvest, start at the top following the stem and roots of the vine. 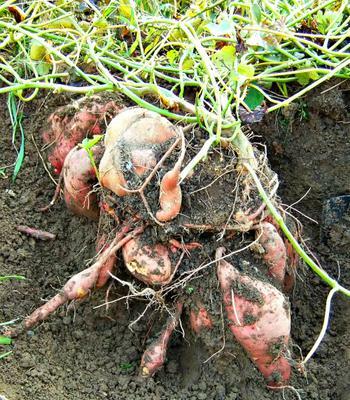 You will find the sweet potato tubers along the roots just under the vine stems. Set the field meant for planting to form ridges/mounds. With the previously kept vines, cut them in to 3 node pieces for planting. Using a simple stick open up the mound or ridge surfaces to place the vines. Then gently cover the vine with soil to facilitate root formation. Ensure that the mounds or ridges don’t have cracks to prevent room for beetle infestation.